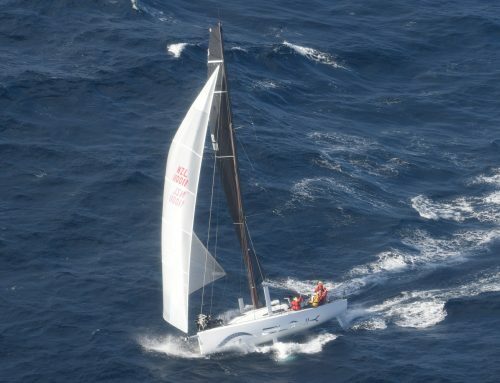 It’s no surprise that the fleet are being blasted by a strong northerly on the race course from Auckland to Noumea. This was in the forecast and the crews knew what they would be up against. 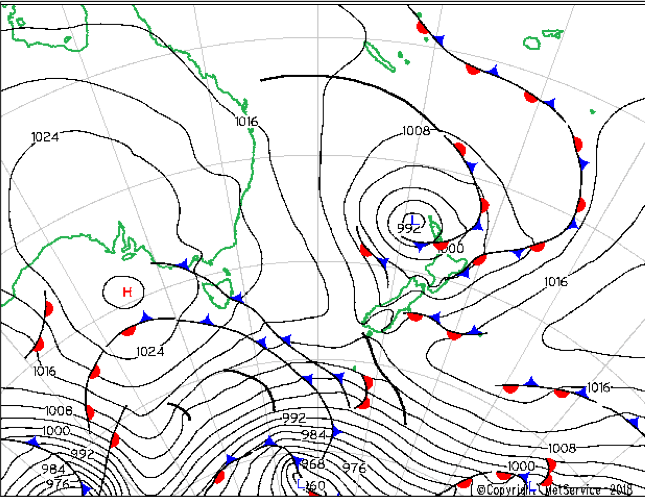 The observations confirm the MetService predicted movement of the low pressure centre towards the top of NZ. The rotation of winds and clouds round the centre of the low is clear in the satellite scatterometer winds, the visual satellite and the surface observations. As predicted the fleet has been knocked through the morning as the wind changed from easterly to northerly. This is due to the low pressure tracking eastwards, with the low centernorth east of Ahiparaat 1500 this afternoon. Ran Tan II placed themselves furthest to the east over night, allowing them to sail clear of North Cape in this changing breeze. Ran Tan II tacked on to port around 11am this morning, and is sailing in lifted breeze, their tack followed by Miss Scarlett on a similar line. 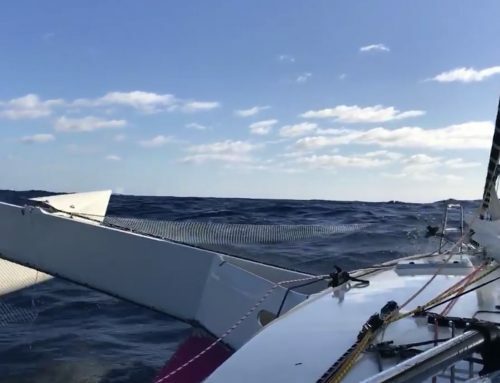 CarreraS tacked around noon, while Equilibrium and Blink continued west. The reasoning for continuing west is likely to be for two reasons, it will allow a earlier transition to the southerly winds on the western side of the low and a more westerly position may be seen as safer as the low would be moving away from your longitude. 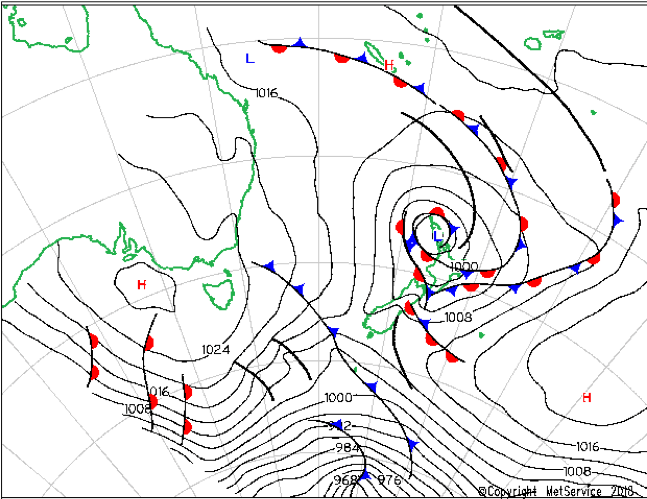 Overnight we expect to see the wind continue to clock left, with northerlies becoming westerlies then south westerlies. 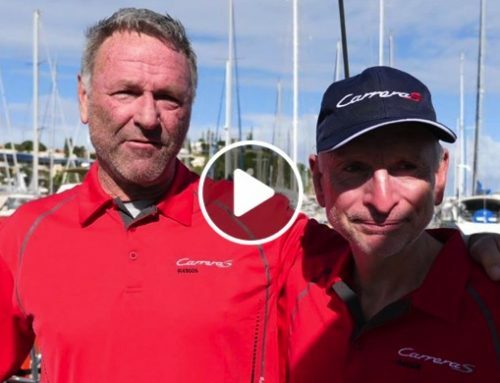 The fleet will be their easing sheets for a fast next 24-48 hours, with the biggest gains likely to be made by the boats who are furthest west. Notorious and Faurax and maybe CarerraS (based on when they were still heading north) will have to continue close hauled to stay to the west of the rhumbline.